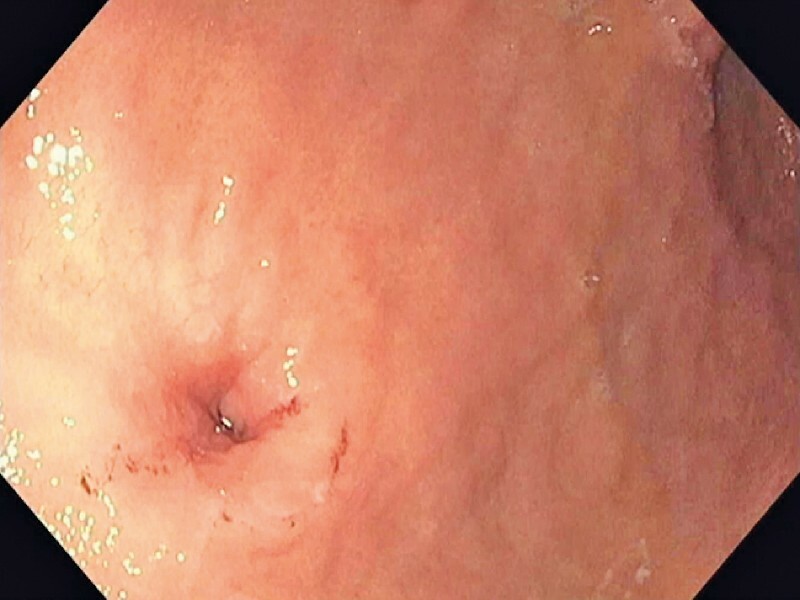 Persistent gastrocutaneous fistula (GCF) after percutaneous endoscopic gastrostomy (PEG) tube removal is an uncommon complication . Advances in endoscopy have enabled endoscopic closure of these defects with a multitude of modalities, including argon plasma coagulation (APC), endoscopic suturing, and over-the-scope clips (OTSCs)   . 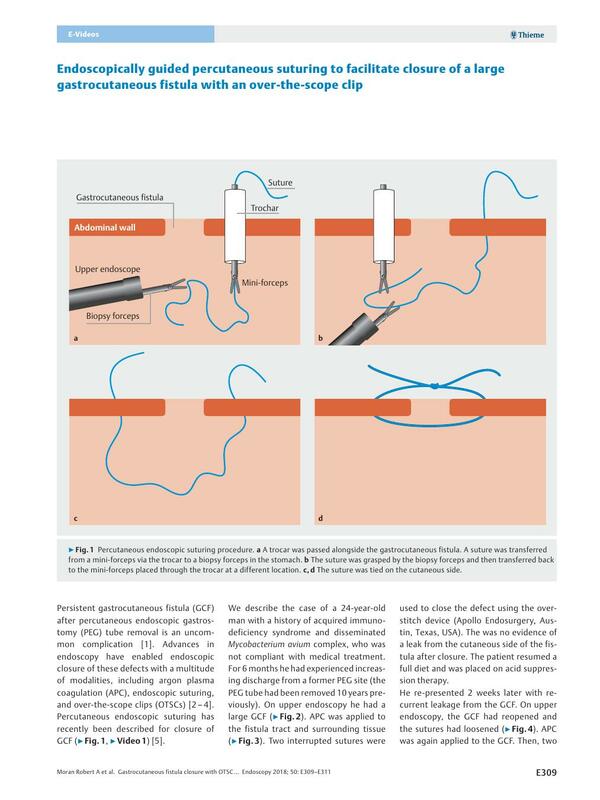 Percutaneous endoscopic suturing has recently been described for closure of GCF ([Fig. 1], [Video 1]) . Fig. 1 Percutaneous endoscopic suturing procedure. a A trocar was passed alongside the gastrocutaneous fistula. A suture was transferred from a mini-forceps via the trocar to a biopsy forceps in the stomach. b The suture was grasped by the biopsy forceps and then transferred back to the mini-forceps placed through the trocar at a different location. c, d The suture was tied on the cutaneous side. Video 1 Endoscopically guided percutaneous suturing to facilitate closure of a large gastrocutaneous fistula with an over-the-scope clip. We describe the case of a 24-year-old man with a history of acquired immunodeficiency syndrome and disseminated Mycobacterium avium complex, who was not compliant with medical treatment. For 6 months he had experienced increasing discharge from a former PEG site (the PEG tube had been removed 10 years previously). On upper endoscopy he had a large GCF ([Fig. 2]). APC was applied to the fistula tract and surrounding tissue ([Fig. 3]). Two interrupted sutures were used to close the defect using the overstitch device (Apollo Endosurgery, Austin, Texas, USA). The was no evidence of a leak from the cutaneous side of the fistula after closure. The patient resumed a full diet and was placed on acid suppression therapy. Fig. 3 Argon plasma coagulation of mucosa surrounding the gastrocutaneous fistula. He re-presented 2 weeks later with recurrent leakage from the GCF. 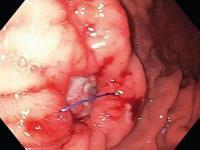 On upper endoscopy, the GCF had reopened and the sutures had loosened ([Fig. 4]). APC was again applied to the GCF. 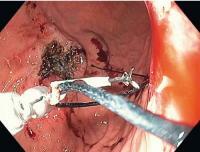 Then, two percutaneous endoscopic sutures were used to close the GCF ([Fig. 5]). After suturing, the edges of the fistula were more closely approximated; however, the fistula remained open ([Fig. 6]). An OTSC was used to close the fistula, as it was now possible to bring the edges of the fistula into the cap of the OTSC delivery device. There had been no further leakage from the GCF 12 months following the closure. Fig. 4 Previous endoscopic sutures had loosened and the fistula tract was wide open. Fig. 5 Transfer of suture from mini-forceps to biopsy forceps during endoscopically guided percutaneous suturing. Fig. 6 Approximation of gastrocutaneous fistula after endoscopically guided percutaneous suturing. 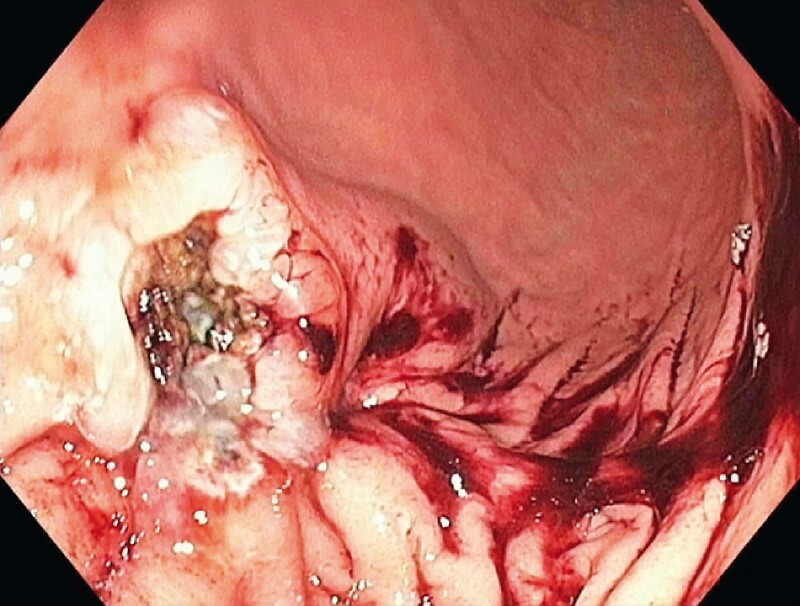 In large GCFs, percutaneous endoscopic suturing can facilitate the apposition of the gastric mucosal surface to allow complete closure of the fistula tract with an OTSC.